China in the early 1930s could be a dangerous place, particularly for foreign missionaries. Natural disasters and diseases were terrible threats, along with roving bands of bandits and political fighters. In August, 1931 communist guerillas kidnapped Columban Father Hugh F. Sands and took him prisoner. In mid-1932 his captors released him, but during his captivity he had a historic encounter which would have great future significance for the Columban Fathers in China. On the afternoon of Christmas, 1931, a young communist guerilla leader named Mao Zedong visited Father Sands in his cell and had a pleasant conversation with him. They made small talk, including discussing the differences between the English and Chinese languages, and then Mao left. But it would not be the last that the Columbans heard of Chairman Mao. His communist forces took over China in 1949 and began the process of expelling and threatening missionaries and other foreigners. 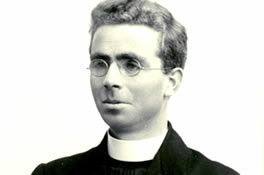 Mao’s regime imprisoned many Columbans, including Bishop Edward J. Galvin, and the last Columbans were forced to leave China in the early 1950s. Father Sands would also endure captivity at the hands of Japanese troops who were occupying China during World War II. Despite these hardships, Father Sands led a long and productive life. He recounted his fateful meeting with Mao in a December 1976 Columban press release.